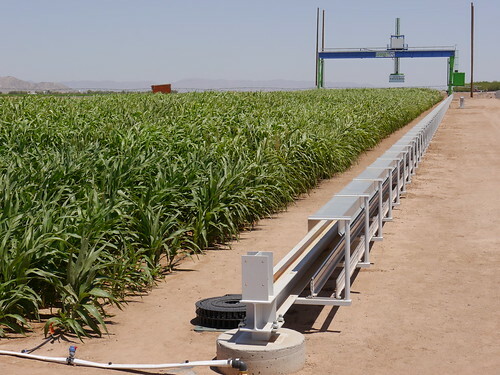 ARS scientists and their partners are using a giant electronic scanner in Maricopa, Arizona to study the growth characteristics of sorghum plants as part of a project designed to speed biofuel crop development. Photo by Jeffrey White, Agricultural Research Service. With its 30-ton frame and 50-foot-high catwalk, the newest scanner for measuring crop plants in Maricopa, Arizona, can be seen for miles. It looms over a tract the length of two football fields and moves along steel rails. “When people saw this big apparatus being built here, they started asking if we were going to be looking for space aliens,” says Jeffrey W. White, an Agricultural Research Service (ARS) plant physiologist with the Arid-Land Agricultural Research Center in Maricopa. Rather than studying the heavens, the scanner is measuring the individual characteristics of thousands of energy sorghum plants growing underneath it. The effort could play an outsized role in meeting the Nation’s future energy needs. This research is designed to speed up the pace of bringing biofuels to market and is part of a program sponsored by the Energy Department’s Advanced Research Projects Agency-Energy (ARPA-E) known as Transportation Energy Resources from Renewable Agriculture (TERRA). "The TERRA program represents the intersection of biology, engineering and computer science. It capitalizes on public-private partnerships and is really a new horizon for agricultural productivity and sustainability,” says Joe Cornelius, ARPA-E program director. The DOE program in Maricopa is led by investigators from the Donald Danforth Plant Science Center in collaboration with USDA, the University of Arizona, the University of Illinois, Washington University of St. Louis, Kansas State University, Texas A&M University and Clemson University. It builds on strategic investments by USDA and the National Science Foundation. White’s role is focused on developing energy sorghum better able to withstand the droughts and rising temperatures expected with climate change. “Maricopa’s arid climate makes it an ideal site for measuring the effects of heat and drought on bioenergy crops. It’s one of the most challenging environments for growing crops in the continental United States,” he says. The plots in Maricopa include hundreds of lines, cultivars and hybrids of sorghum. As the scanner moves across the field its cameras and sensors pass over the plants capturing data about them in granular detail. The researchers expect to see numerous variations in heat tolerance and water stress from one plant to the next. The scanner is designed to save time. In a half-day it collects as much data as a single person could gather with a handheld scanner in five weeks. Some 42,000 individual plants are being scanned. The data collected will be publicly accessible and the researchers expect it to be mined for years to come. The team is also using the scanner to advance a technology still in its infancy: gathering data with improved cameras and imaging systems that are sensitive to different wavelengths of light. The same type of crop plants, sometimes growing side by side, can vary widely in how they respond to water or heat stress. Scanners that detect different wavelengths can pick up details that escape the naked eye. Those details—such as the temperature of a plant’s foliage, the amount of chlorophyll it contains and the surface area of its developing leaves—can be important indicators. The focus of the current program is sorghum, a drought-tolerant crop that can provide food, fuel and feed. In the future, other crops including corn, soy beans, wheat and lettuce could benefit from what the researchers learn. “This technology could lead to advances in a wide range of areas,” White says.